For aeqai I reviewed two earlier editions of “Bookworks” (2013 1 and August 2016 2), Like its predecessors, the 18th Annual Cincinnati Book Arts Society (CBAS) 3 exhibition covers a lot of aesthetic ground trying to demonstrate the diversity of how artists interpret the Platonic idea of book. There are conventional volumes and sculptural objects that may only allude to that idea. There are examples that are exquisitely executed or rough and raw, beautiful or aggressively ugly, sweet or bitter, charming or repellent, amusing or deadly serious, personal or political. This year the two jurors, Matt Distal, curator at The Carnegie, and Ashley Jordan of the Freedom Center Underground Railroad Museum, selected about 40 pieces by CBAS members. 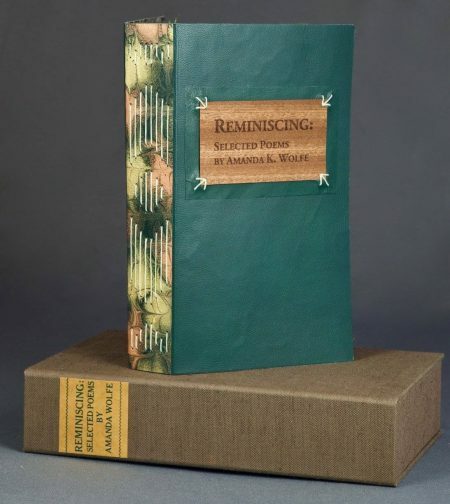 They gave the Award of Merit: First Prize Bookworks XVIII to Judith Serling-Sturm’s An Incomplete Visual History of Book Banning in America – or – PS: It’s Not Going To Work. Last year she received the Second Award of Merit for her Unarmed in America, 2016, 4 which recorded deaths of unarmed men at the hands of the police: a ratio of 21 black men to one white man. Serling-Sturm effectively uses the book form to make strong political statements. 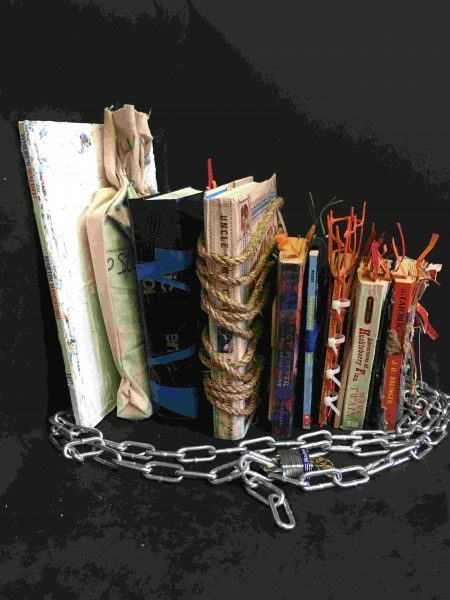 This year’s entry, the president of the CBAS has bound actual books, including Where’s Waldo?, The Adventures of Captain Underpants, Harry Potter and the Sorcerer’s Stone, The Catcher in the Rye, and the dictionary, with rope or tape, making them impossible to open. They are arranged as if on a shelf and encircled by a padlocked chain. On the label (this exhibition always has very informative labels, sometimes discussing technique, sometimes the inspiration and intent of the maker), Serling-Sturm explains, “Books have been banned ever since there were books. My research unearthed much that made me shake my head, much that shocked me (did you know that Noah Webster re-wrote the Christian Bible, editing the ‘nasty bits’? ), and at times, it made me sympathize with those seeking to ban a work. In the end though a ban doesn’t shut down an idea,” which she expresses by leaving a key in the padlock. Political statements abound this year. Cecelia S. Chewning’s Super Women, 2017, is an accordion book made of hot-pink or orange-sherbet- colored pages with text by women inspired by the Women’s March in DC on January 21, 2017, 5 the day after Donald J. Trump’s inauguration. 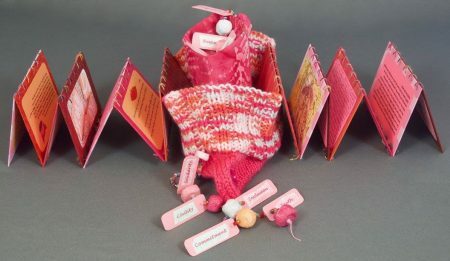 Chewning asked each woman how she would use her super powers to “make change in her life, that of her community, or the larger world.” The book’s “slipcase” is an upturned knitted pink hat like those worn by women in the marches. With so much funky construction and polemic scattered about, it was refreshing to see Patty Bertsch’s beautifully bound Gingko Leaves. She incised the leaf design on a linoleum block and used it to emboss the brown leather cover. The image is as delicate as the leaf and so subtle that you must come close to see it, something all books demand whether it’s a paperback novel or the most extravagant artist book. The accordion book is a popular format, and about a quarter of the pieces on view fall into that category, a form originating in Asia as an alternative to scrolls that were unmanageable in size. One standout is Karen McGarry’s It’s Not Pandora’s Box. Black-and-white illustrations of maps that could have been clipped out of a 19th-century book are pasted onto pages that make up the strip. Collaged onto them are images of fish and ships; a Bactrian (double-hump) camel; Thoth, the Ibis-headed Egyptian god; the 1849 The Great Wave Off Kunagawa by Katushika Hokusai; and more. The interior of the box is covered with a running stream of tiny script; the exterior is découpaged 6 with other pieces of ephemera. The box is too large for the folded strip but there’s an odd rack holding cards that might be intended to go on top of the strip in the box. Is it to hold the strip down? Each of the 40 or so pieces in the exhibition deserves a look so don’t speed-read through it. “Bookworks, XVIII Annual Cincinnati Book Arts Society Exhibit,” on view through Sept. 3, 2017 at The Public Library of Cincinnati and Hamilton County, Main Library Atrium, 800 Vine St., Cincinnati, OH. 513-369-6900, www.CincinnatiLibrary.org. Sun., 1 pm-5:00 pm; Mon.-Wed., 9 am-9 pm; Thurs.-Sat., 9 am-6 pm. 1 Karen S. Chambers, “Bookworks 14 – Cincinnati Book Arts Society’s Annual Exhibit,” The Public Library of Cincinnati and Hamilton County. One might say the concept of book as artwork dates back to the 7th to 4th millennium B. C. with the very first examples of text carved into stones. This is especially so when mnemonic symbols were replaced by ideograms or pictographs. In the modern era, Germano Celant argued in Book as Artwork 1960/1972 that the artist’s book debuted in 1960, and his volume is considered to be the first to deal with the new medium. 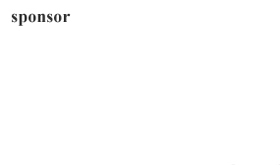 Now I have no desire to give a comprehensive history of the genre—nor could I. Instead I just want to share some thoughts about “Bookworks 14 – Cincinnati Book Arts Society’s Annual Exhibit,” installed in the atrium at the Main Library downtown. This exhibition presents 41 works by 25 makers, by my count, and there are three veins of exploration: traditional books, accordion-format books, and books as sculpture. Each artwork is accompanied with a statement by the artist. The information ranges from explanations of processes to the artist’s inspiration, and, a bit too often, to how much fun the book was to make, conjuring up the image of a kids’ workshop. The best place to start is Karen Hanmer’s “Dirck de Bray: A Short Instruction in the Binding of Books.” On the label Hanmer notes that the book uses quotes from the 1658 text, which has been edited by Koert van der Horst and Clemens de Wolf. There are illustrations from the original book that have been printed on vellum to reference the original binding. Prints of two of the original pen-and-watercolor drawings are used on the cover. One depicts workers screwing down what looks like a bulky wooden press, which is probably a plough used to trim pages to the same size. The other may illustrate a papermaking workshop with a birdcage hanging above the artisans, a charming touch. The label also lists the techniques and materials used, but fails to explain them. So as soon as I sat down to write this review, I did a quick computer search. The book has a Bradel binding, a technique that dates from the 18th-century in Germany and (per Wikipedia) has “a hollow back and visible joint built up on the book.” It’s a durable binding that allows the book to open fully (alas, here we can see only the cover). Traditionally this type of binding has different materials covering the outside boards and the spine, but Hanmer has used Cave (the name of the handmade-paper mill) paper for both. The end sheets are Bugra, a paper produced by a German paper mill for pastel and charcoal drawings, but which works well for other drawing mediums. It has rolled leather end bands (headbands and tailbands) filling the gap between a section and the edges of the boards, which helps keep the sections from collapsing from gravity and lessens damage when the book is pulled off the shelf by its headband. It also has a graphite top edge, 23-kt. gold stamping, and hand-tooling. That may be TMI but I felt compelled to track it all down. Next take a look at the accordion books, which are made of a continuous folded sheet of paper. They originated in Asia as an alternative to scrolls that were unmanageable in size. 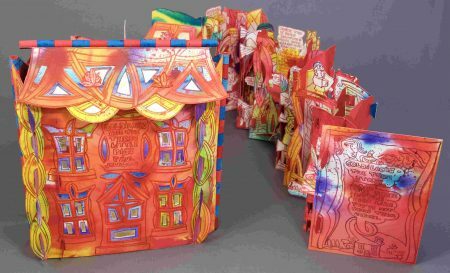 There are plenty of websites about how to make accordion books, and here I want to add “and they can be made by any age.” Of course, that does not disqualify them as a serious medium for artists. Among the 10 or so accordion books shown is Margaret Rhein’s modest “Architectural Stamp Accordion Book.” Its title pretty much describes it. 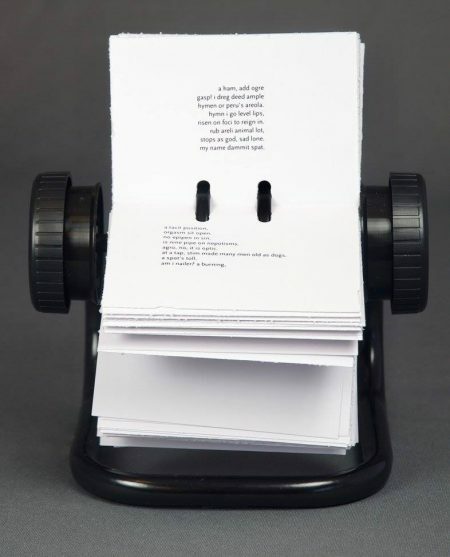 Rhein relates that her mother in law, Faith Golder, gave her a sheet of black-and-white stamps featuring Masterworks of Modern American Architecture. The book, made of Rhein’s handmade paper, is postage-stamp size with the stamp pasted on one page with a miniature text describing it facing it. When folded, it is tied with a narrow black silk ribbon and fits into a tiny slipcase. Rhein has turned some 37-cent stamps into something precious, in the best sense of the word. Carol Fried addressed the future of the book in “Only Yesterday Touch Was Possible.” The black, flying-saucer-shaped sculpture has a lens in its center. Her label explains her concept: “How do we experience the notion of ‘book’ in the 21st century? Placing a book in a container that projects it and contains it, explores how we experience the idea of a book in a world filled with Kindles, i-books, computers, and recordings. A floating facsimile, a fata morgana, a book that is both here and not here, that is what ‘Only Yesterday Touch Was Possible’ represents.” It’s satisfying as an object, but I appreciated her explanation. There’s much more that could be written about the other works in the show, but they really need to be seen instead of reading about them. “Bookworks 14 – Cincinnati Book Arts Society’s Annual Exhibit,” on view through Aug. 18, 2013, at The Public Library of Cincinnati and Hamilton County, Main Library Atrium, 800 Vine St., Cincinnati, OH. 513-369-6900, www.CincinnatiLibrary.org. Sun., 1 p. m.-5:00 p. m. Mon.-Wed., 9 a. m.-9 p. m., Thurs.-Sat., 9 a. m.-6 p. m.
Lou Kroner, “Paul’s Blues,” courtesy of The Public Library of Cincinnati and Hamilton County. Karen S. Chambers, “Bookworks 14 – Cincinnati Book Arts Society’s Annual Exhibit,” The Public Library of Cincinnati and Hamilton County,” aeqai.com. 2 Karen S. Chambers, “‘Bookworks XVII,’ The Public Library of Cincinnati and Hamilton County,” June 2014, aeqai.com. 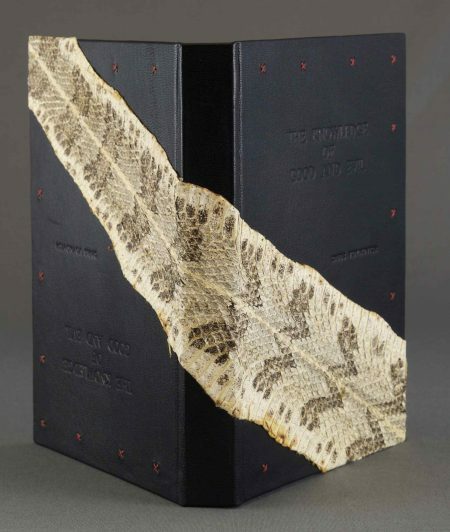 Chris Voynovich, “The Knowledge of Good and Evil”, 2016, embossed leather and snakeskin book cover. Photo by Patty Bertsch. 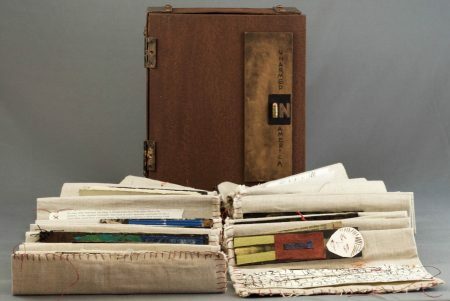 Judith Serling-Sturm, “Unarmed in America”, 2016, cloth book in wooden case. Photo by Patty Bertsch. Paul Johnson, “Goldilocks—The True Story”, 2016, pop-up book, industrial textile dyes on watercolor paper. Photo by Patty Bertsch. 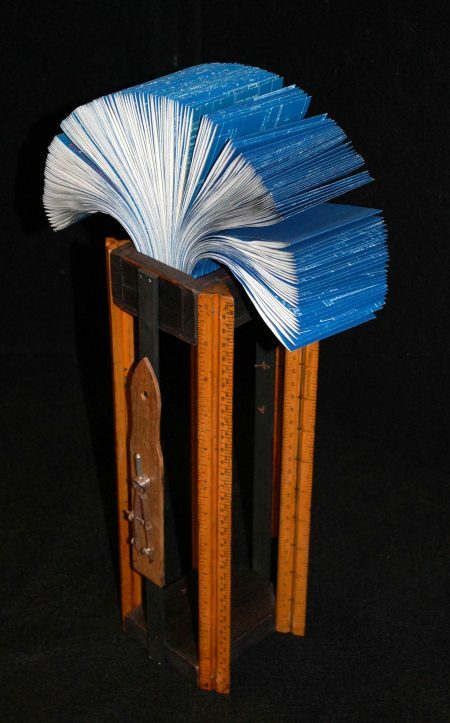 “Bookworks XVII,” through September 4, 2016, The Public Library of Cincinnati and Hamilton County, Main Atrium, 800 Vine St., Cincinnati, OH 45202, 513-369-6900, cincinnatilibrary.org. 9 a.m.-9 p.m., Mon.-Wed.; 9 a.m.-6 p.m., Fri.-Sat. ; 1 p.m.-5 p.m., Sun. Cincinnati Book Arts Society, cincinnatibookarts. 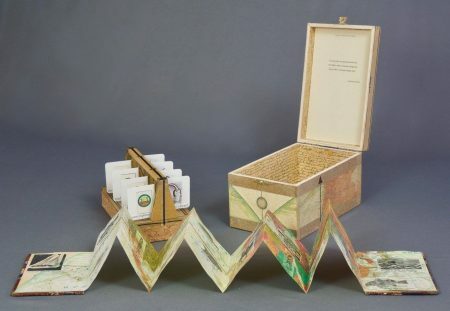 Karen S. Chambers, “Bookworks XVII,” The Public Library of Cincinnati and Hamilton County. aeqai.org, August 2016. 3 Cincinnati Book Arts Society (CBAS), which began in 1998, is a nonprofit organization comprised of professionals and amateurs from all quarters of the book, paper and printing arts-bookbinders, paper makers, printers, paper marblers, and book artists, as well as archivists and conservators–for the purpose of creating a spirit of community among hand workers in the book arts and those who love books. Cincinnati Book Arts.com. 4 Ibid., Chambers, “’Bookworks XVII,’ The Public Library of Cincinnati and Hamilton County,” August 2016. 5 In Washington, DC, the crowd was estimated to be between 440,000 and 500,000, the largest demonstration since the anti-Vietnam War protests in the 1960s and 1970s. Worldwide 673 sister marches took place, and the total number participating was five million. 6 Découpage may sound like a hobbyist term, but long before Martha Stewart, East Siberian nomads cutout felt to decorate the tombs of their deceased and then to China in the 12th century and Italy in the 17th. Wikipedia.